Marlin F. “Whitey” Groft, 94, of Lancaster, passed away on January 14, 2018, at the Mennonite Home. He was the loving husband of Vivian Mae (Acker) Groft, his wife of nearly 67 years, whom he married on June 22, 1951. Born in Lebanon, he was the second youngest of 14 children born to John and Emma (Barshinger) Groft. A graduate of Lebanon High School, Marlin worked for the Civilian Conservation Corps where he assisted in the construction of the 14th Street Bridge over the Potomac River in Washington, DC. He then went to work as a silk screen operator for a textile plant. 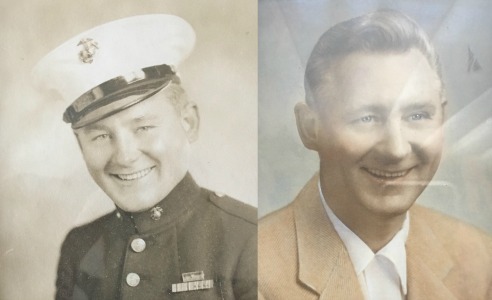 Marlin enlisted in the U. S. Marine Corps at Stahr Armory in Lancaster shortly after Pearl Harbor and volunteered for the 1st Marine Raider Battalion, the famed Edson’s Raiders. As a Raider, Marlin first saw combat on Tulagi when his unit became the first American troops in either Europe or the Pacific to go on the offensive against the Axis forces. Later on Guadalcanal, Marlin’s unit held a hill known as Bloody Ridge for three days and two nights against overwhelming Japanese forces. The fighting was often hand-to-hand. Their valiant defense of the crucial hill saved the Guadalcanal operation – a turning point in the Pacific Theater. Marlin also saw action on New Georgia where he and his comrades fought both the Japanese and the harsh jungle conditions of mud, pests, and disease. After the disbanding of the Raiders by the Marines, Marlin served briefly with the military police for the 29th Marine Regiment before being assigned to King Company, 3rd Battalion, 22nd Regiment where, as a sergeant, he became a squad leader. When the war ended he was preparing for the invasion of Japan. After the war, Marlin’s unit spent six months in China before shipping home. There they took part in the surrender of thousands of Japanese soldiers. He left the Marines briefly but re-enlisted and became a drill instructor at Parris Island, S.C. He also was a sergeant in charge of the yacht basin in Guantanamo, Cuba. Marlin left the Marines for good in 1951 after 10 years of service. After the war he worked as an experimental tool maker for RCA in Lancaster, retiring in 1985. He worked on power tubes as part of the Apollo Program. Some of these power tubes remain on the moon to this day. During his long, colorful life, Marlin was a champion military boxer, a champion pipe smoker, avid fly fisherman, Civil War scholar, devoted fan of Abraham Lincoln, a baker, golfer, gardener, lover of classic poetry (much he could recite from memory), devout Christian, and story-teller extraordinaire. Recently, he penned his memoirs in the book Bloody Ridge and Beyond. Marlin frequently attended Raider reunions at Quantico, VA. In 2002, he returned to Guadalcanal and Tulagi on the 60th anniversary of those battles, escorted by his son Eric. He lived considerably longer than his Commanding Officer Colonel Merritt Edson had predicted. The night before the Battle of Bloody Ridge, Colonel Edson predicted that many in this courageous group of 18 and 19-year-olds would not survive the battle. Even less would survive to the age of thirty. “Whitey” defied all odds. In addition to his wife, he is survived by a daughter, Charmaine Corslund of Collegeville, PA; two sons, Eric D. of Annapolis, MD and Brian L. COL. USA (Retired) (husband of Bonny Speitel) of Woodbridge, VA; six grandsons: Zane, Forest, Avery, Brian Lee, Josh and Caleb, one great-granddaughter, Ava and countless nephews. Also surviving is a sister, Anna Groft Good of Lancaster, PA. Extending our condolences to the Groft family. I am so sorry for the passing of your loved one. Reading about him, I am struck by his courage, dedication, and many interests in addition to his loving family. You were all lucky to have him in your lives for so long and I know he will be remembered with great love. Very sorry to read of your Father’s passing. Another member of the greatest generation is gone. I met your Dad when I waited on him at the Post Office window. What a peppery colorful man! He got mad at me when I mentioned Carlson’s Raiders and informed me that Carlson almost left Jimmy Roosevelt on Makin Island, after that he would wait for me to wait on him. I helped him mail the plaque that he placed on Bloody Ridge. He had a wonderful life and you have so many memories to remember him by so always hold them close to your heart. Marlin was our next door neighbor when I was growing up, until I was about 16. He was like a second father to me. My brother, sister, and I played with Charmaine, Eric, and Brian, and our families were close. He made time to play and interact with many of the neighborhood children, and was a role model and hero to many of us. The fact that I went to West Point and served a career of 21 years in the Army speaks to the impact he had on my life. He was a true American hero, and I , for one, will never forget him. Well done, sir. Your legacy lives on. Of the many veterans I have met while I worked as a newspaper reporter Whitey truly stuck out as a great and brave man. I was proud to have worked with him on his memoirs and to have called him a friend. I enjoyed my visits with him and Vivian and I will miss him. Semper Fi Marine. Marlin was my privilege to have known you and your lovely wife. I remember getting off work at SKH and you and I stood there for over a half hour talking. You shared your experience from WWII and Edson Raiders. That was fascinating to have heard your story. And I hope your wife still has that Lancaster Map from the 1800’s. The Knapp brewery shown is the brewery my great grandfather bought. So proud to have had your friendship. May you be with Our Risen Lord. I wanted to express my and my family’s sadness in the passing of your father. Eric and I go way back to State Street! I often think back to those days when life was certainly simpler. After reading your dads obit, I learned much about your dad. He certainly had a brilliant and exciting military career, and one that I am sure you are all very proud of. I pray time will ease your sorrow. Happy memories are treasures you will have with you always.